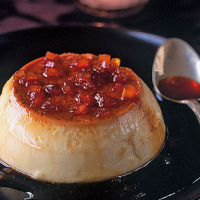 These upside-down puddings never cease to amaze: as you turn them out, you see the pool of caramel flood over the plate while the little custards themselves gently wobble – a gorgeous sight to behold. Preheat the oven to 150°C, gas mark 2. Scald the milk with the ginger and vanilla pod and set aside to cool. Place 125g sugar in a saucepan with 50ml water and heat gently until dissolved. Bring to the boil and simmer until deep golden in colour. Halt the cooking by plunging the base of the pan into a sink of icy water, then add the stem ginger. Before the liquid has a chance to harden, pour it into six 175ml dariole moulds or ramekins. Swirl it around to cover the base of each mould and set aside. It will then set hard. Lightly whisk the eggs and remaining 3 tbsp sugar in a large mixing bowl; having removed the vanilla, beat in the milk. Strain the mixture, then divide between the moulds. Set a roasting pan on a low shelf in the oven and half fill with boiling water. Place the dishes in the water – it should reach about halfway up – and cook for 40–45 minutes until the custards have set. Remove from the oven and allow to cool for 40–45 minutes. Cover and chill in the fridge overnight. Run a sharp knife around each mould. Place each on a plate that has a shallow dip in it that will catch the pool of caramel. Flip the moulds over, shaking them to dislodge the custards. The Corker recommends- A glass of tawny port will echo the supple voluptuousness of these sweet custards.